The title of this essay gives away its complete content, without suggesting its conclusion-namely, that at least one of the two greatest Americans of the eighteenth century was indeed a lawmaker and not merely a symbol in the Constitutional Convention. Washington and Franklin, uniquely, have been lionized as “lending their names” to the founding. Not only contemporary scholarship has taken this view; it was also characteristic at the time of the founding itself, insisted on by supporters and opponents of the Constitution. “An union of the abilities of so distinguished a body of men, among whom: will be a FRANKLIN and a WASHINGTON, cannot but produce the most salutary measures.” “These characters flatter themselves that they have lulled all distrust and jealousy of their new plan by gaining the concurrence of the two men in whom America has the highest confidence [George Washington and Benjamin Franklin].” “.. your name has had already great influence to induce the States to come into the measure, … your presence would confer on the assembly a national complexion, and that it would more than any other circumstance induce a compliance with the propositions of the convention.” Franklin was “a catalyst” at the Convention These views suggest clearly that the views far less than the stature of men like Washington and Franklin contributed to the achievement of the Convention. The burden of this essay is to paint a different picture. We are further authorized to undertake this task by Washington’s sharp retort to the suggestion from Henry Lee that Washington use his “influence” to deal with Shays’ Rebellion in Massachusetts. “Influence is no government,” he responded. Thus, even if Washington and Franklin had great influence, in Washington’s eyes we would still be compelled to inquire how far they governed. Specifically, I invoke four works of Washington and Franklin in order to analyze their contributions to the Convention. The problem this creates stems from the fact that these four works play their chief role outside the Convention rather than within it. This procedure would seem to lend credence to the claim that what they had to say within the Convention was of less significance than who they were. That, however, is not my intention. Accordingly, I will also discuss their contributions to the Convention itself, as a way of clarifying the context in which I consider the four works. By recovering their specific contributions within the Convention (often by imputation but not without evidence), I will make clear that the relevance of these four works is thematic rather than emblematic. The four works themselves are Franklin’s pre-Convention essay, “Consolation for America,” his major speech at the close of the Convention (with respect to its use outside of the Convention), Washington’s 1783 “Circular Address to the Governors” (with respect to its use in 1787 prior to the Convention’s opening), and his “Discarded Inaugural Address” of 1789. Franklin practiced this mode of indirection in several such projects, including the establishment of volunteer fire companies and an association for the defense of the colony. In the latter cases, he would first publish discussions in the newspapers – usually anonymously. In addition, he would often draw together small groups – such as the group which preceded the foundation of the subscription library or his secret “Society of the Free and Easy.” In such forums he would develop ideas and propagate them in the manner which seemed best to suit the occasion. Generally speaking, however, he eventually emerged as the “founder” of the public institutions which arose from these ventures. There are two notable exceptions to this model, the 1754 “Albany Plan of Union” and the 1775 “Articles of Confederation” which he carried into the Continental Congress. Franklin did not prepare the way for these with preparatory public discussions; nor did he obscure his authorship. Each of these bids to become legislator failed. Early in 1787, when matters had been set in motion for the Constitutional Convention but before Congress had added its voice to the call, Franklin did two things which were significant for the Convention. First, he published “Consolation for America, or remarks on her real situation, interests, and policy,” in the American Museum; shortly thereafter he formed the Philadelphia Society for Political Inquiries, a private if not secret group devoted to sharing ideas of political analysis and design. The charter of the Society was published in a subsequent issue of the American Museum. In the essay Franklin inculcated a view of an American nation unnecessarily concerned with its situation. Opening with an account of the difficulties of the first settlers of New England, he described their development of a tradition of fast days to express their unhappiness and pray for help. The tradition persisted until the day when, the assembly proposing another fast day, a “farmer of plain sense” suggested that matters were not so bad as they seemed. He urged attention to their bounties – “seas and rivers … full of fish, the air sweet, the climate healthy; and above all, that they were in full enjoyment of their liberty, civil and religious.” Instead of a fast, he proposed that they proclaim a thanksgiving, which they did. From this illustrative tale, Franklin turned to the “public newspapers,” which were filled with complaints. The balance of the essay was a commentary on these complaints, showing prospects to be “less gloomy than has been imagined.” Franklin beheld a people better fed, clothed, lodged, and paid than in the old world; thus, no need to despair of material circumstances. As to the “factions” which caused alarm, “such will exist wherever there is liberty.” Moreover, the parties among the Americans “aim all at the public good,” differing as to modes of producing it. Finally, there are those who despair for the future, fearing not poverty but increasing wealth and its attendant luxury. To this he responded that the newly won independence, plus the fact that increasing wealth might incite to “labour and industry … producing a greater value than is consumed,” will render sumptuary laws unnecessary. In sum, then, Franklin portrayed the American “sons of the earth” as adequate to every emergency and waxing to increasing greatness. The moral character and happiness of mankind, are so interwoven with the operations of government, and the progress of the arts and sciences, is so dependent on the nature of our political institutions, that it is essential to the advancement of civilized society to give ample discussion to these topics. Moreover, the inquiries proposed had a “peculiar magnitude and necessity” in the American republic. Its inhabitants required a means to escape the models of those nations from which they had” derived our origins, … laws, … opinions, … and manners.” Theretofore, America had promiscuously retained the “errors and improvements” of the old regimes and “grafted on an infant commonwealth the manners of ancient and corrupted monarchies.” Although a distinct government had been erected in North America, only a “partial independence” had been attained. The revolution can only be said to be compleat, when we shall have freed ourselves, no less from the influence of foreign prejudices than from the fetters of foreign powers. When breaking through the bounds, in which a dependent people have been accustomed to think, and act, we shall properly comprehend the character we have assumed and adopt those maxims of policy, which are suited to our new situation…. the arduous and complicated science of government, has been generally left to the care of practical politicians, or the speculations of individual theorists. From a desire therefore of supplying this deficiency, and of promoting the welfare of our country, it is now proposed to establish a society for mutual improvement in the knowledge of government, and for the advancement of political science. Franklin operated privately, secretly, Washington was perfectly esoteric in his conduct regarding the development of an American republic. He published no treatises in his own name and founded no societies. Indeed, following the close of the war, he did not even hold any public office. Nevertheless, he worked no less – and perhaps even more – assiduously toward the goal of a national union. The locus classicus for Washington’s ideas is the renowned “Circular Address to the Governors of the Thirteen States” of 1783. Before we open the leaves of that document, however, it would be wise to conceive what foundation we might have for expecting to find in it evidence of Washington’s ideas and influence. In the period from March, 1787 to 1788 Washington’s “Circular Address” was widely cited and reprinted in newspapers or pamphlets across the country. So far as we can tell, this phenomenon was entirely spontaneous. The address had been immensely popular when originally issued, and now it could be seen that it was also largely understood as Washington had intended it. The chief difficulty to remove concerning the “Circular Address” is the notion that it represented chiefly Washington’s fulfillment of his duty to his officers and soldiers to urge a just settlement of their accounts. It did that, to be sure. But it did far more than that and was aimed at far more. To understand why the address took on a broader target, it is necessary to place it in the context of Washington’s ideas prior to 1783 and in the period leading up to the Constitutional Convention. While I do not wish to make the case for Washington’s influence in the Convention to depend on his earlier activities, they must at least be invoked far enough to enable us to understand that the resurrection of the “Circular Address” was no anomaly in 1787. Come then, my Brethren, Unite with us in an indissoluble Union…. We look forward with pleasure to that day not far remote (we hope) when the Inhabitants of America shall have one sentiment and the full enjoyment of the blessings of a free government. While the first of these appeals may be read as indicating an appeal only to a notion of contingent union, when combined with the second it seems clear that Washington meant to lay aside the “distinctions” of separate colonies once and for all. Washington understood the union to follow from such a move as reposing on the hope of a specific form of government: republican government. When he was called upon to vindicate his honor and rank against that of General Gage, he did so by invoking that most honorable rank “which flows from the uncorrupted Choice of a brave and free People, the purest source and original Fountain of all power.” This formulation continued to guide not only Washington but the leading founders throughout the era of the Revolution, achieving its consummate expression in the pages of The Federalist, written in defense of the Constitution. If we are to pursue a right system of policy, in my opinion, there should be none of these distinctions. We should all be considered, Congress, Army, etc. as one people, embarked in one cause, in one interest; acting on the same principle and to the same end. To form a new government, requires infinite care, and unbounded attention; for if the foundation is badly laid the superstructure must be bad, too much time, therefore, cannot be bestowed in weighing and digesting matters well. We have, no doubt, some good parts in our present constitution; many bad ones we know we have, wherefore no time can be misspent that is employed in seperating the Wheat from the Tares. My fear is, that you will all get tired and homesick, the consequence of which will be, that you will patch up. some kind of constitution as defective as the present; this should be avoided, every man should consider, that he is lending his aid to frame a constitution which is to render millions happy, or miserable, and that a matter of such moment cannot be the work of a day. Washington gave this advice to his brother in the middle of Virginia’s efforts to repair its constitution and at a time when continental efforts to draft a constitution were just beginning, That he saw them as a single effort may be gathered from his invocation of the fate of future “millions.” That it would take time, and frequently renewed considerations, was the lesson of the years to follow. But that time would not be indefinite was the burden of the “Circular Address” to show, in addition to the specific character of the regime to be founded. Washington had frequently shared the substance of his “Circular Address” with correspondents during the difficult years of the war. At no time, however, had he pulled it together in a single, powerful statement. Prior to drafting and issuing the address he had been urged by several of his colleagues to leave his countrymen such a political testament as a guide for their future considerations. Washington acknowledged these requests with the disclosure that he would, before retirement, “with greatest freedom give my sentiments to the States on several political subjects.” He was careful to point out that he would not confine himself to the “shameful” treatment America’s troops had received from America’s governments. What, then, is the teaching of the “Circular Address?” Washington described it as affording delight to the “benevolent and liberal mind,” whether viewed in “a natural, a political, or a moral point of light.” Why? The situation was such that the American people enjoyed “a vast tract of continent,” assuring “all the necessaries and conveniences of life,” and possessing “absolute freedom and independency.” In short, Americans lacked nothing of what could be called the ordinary incidents or conditions of prosperity. They do, however, lack the one extraordinary condition for the full exploitation of these blessings – namely, “political happiness.” Washington conveyed this bad news in a characteristically positive fashion; he said that “Heaven” left them the “opportunity” for political happiness. The notion of an “opportunity for political happiness” was not mere rhetorical gloss, however. For Washington meant by it, also, the availability of those distinctive conditions and instruments for the attainment of the end. Added to the material conditions of American life were those “treasures of knowledge” which had superseded the “gloomy age of ignorance and superstition” and provided specific tools to establish “forms of government.” The tools: “the free cultivation of letters; the unbounded extension of commerce; the progressive refinement of manners; the growing of liberality of sentiment, and above all, the pure and benign light of Revelation.” With such tools, Washington urged, a people can fashion their freedom and their happiness. Indeed, no external obstacles impede them. 1st. An indissoluble Union of the States under one Federal Head. 2dly. A sacred regard to Public Justice. 4thly. The prevalence of that pacific and friendly disposition among the people of the United States, which will induce them to forget their local prejudices and policies, to make those mutual concessions which are requisite to the general prosperity, and, in some instances, to sacrifice their individual advantages to the interest of the community. It would not defy common sense to notice how differently the fourth recommendation is stated in comparison to the first three. It is still more important to reflect on its significance, since Washington himself expressly omitted to dilate on it, “leaving the last to the good sense, and serious consideration of those immediately concerned.” He did dilate on its accomplishment in his “Farewell Address,” some thirteen years later. There he could conclude that now the “unity of government which constitutes you one people is dear to you. They had come to supplement their love of liberty with the love of being one people. The former is the foundation of the free society, but the latter is the means of preserving it against foreign and domestic assault. The love of being one people is above all the cause of the people’s “political safety and prosperity.” The people had come to vaunt their particularism, the love of the American, and thus gave assurance to individual liberty. The addressee of the fourth recommendation, accordingly, is the people themselves. While the first three recommendations, an adequate national government, appropriate measures to redeem the sacrifices of the soldiers, and provision for continuing defense of the republic, spoke to the institutional requirements of the nation (and Washington made some specific suggestions along that line), the fourth addressed the moral condition by which the promise of self-government might be realized. Ultimately, the attainment of the first three would rely on the fourth, and thus the demand for constitutional reform was primarily the insistence on creating a people as distinct from a nation. Before the citizens could become “the purest source, and original Fountain of all power,” they required to be welded into something more than just an aggregate of individual wills. When Washington warned in the “Circular Address” that Americans might learn that “there is a natural and necessary progression from the extreme of anarchy to the extreme of tyranny,” he meant above all to arraign the notion that individuals could enjoy self-government as anything other than citizens of a common regime. …my wish is that the convention may adopt no temporizing expedients, but probe the defects of the constitution to the bottom, and provide radical cures; whether they are agreed to or not; a conduct like this, will stamp wisdom and dignity on the proceedings, and be looked to as a luminary, which sooner or later will shed its influence. As to the specific political initiatives to flow from either Washington’s “radical cures” or Franklin’s “complete independence,” however, we have no conclusive evidence apart from their contributions in the Convention. And there we find far more of Franklin, to all appearances, than of Washington. Upon a closer inspection, however, we shall be able to discover means to indicate the character of their judgment about specifics and the extent of their influence within the Convention. As the Convention opened the first question pending was that of who should preside. All attention focused on Washington and Franklin. Franklin diverted all hesitation by bringing in the nomination of Washington. With his elevation to the chair Washington fell silent, at least so far as all written records testify. Even when he sat with his delegation during sessions of the “committee of the whole” he made no speech in the Convention (with one notable exception which will be remarked in its place). This pattern, however, conforms generally to what most of his biographers record of his service in the Virginia House of Burgesses prior to independence also. He spoke there but seldom, though apparently with effect. Nevertheless, he did make his views known, and Madison’s “Notes” have left evidence sufficient for us to determine how this was done within doors. This we will use as a basis of comparison with Franklin, who spoke with relative frequency. Before undertaking that comparison, however, I should note that the apocryphal record suggests that Washington did speak during the Convention, though Madison did not record it. Gouverneur Morris, in his eulogy of Washington, records an eloquent speech near the opening of the Convention, and another tale shows Washington rebuking (in general) a fellow delegate who had incautiously let drop his copy of the proceedings where the secret proceedings may have been compromised. In each of these cases, the apocrypha emphasize an authority peculiar to Washington, whereby his words bear the weight of authoritative deeds in the eyes of his fellows. He and Franklin differ sharply in this respect, as we shall see. To illustrate the grounds of the remarks which follow, we should review some of the votes of the Pennsylvania and Virginia delegations in the Convention. 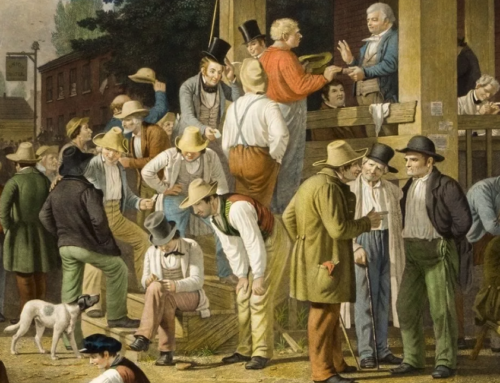 Through them, along with certain evidence of the votes of Washington and Franklin in some cases, we will be able to infer patterns of voting which will suggest the direction of their influences within the Convention. Because the voting all took place within delegations and required at least the minimum of communication required to make votes clear, we will be able to deduce therefrom a fairly coherent view of the preferences of Washington and Franklin within the Convention and, consequently, a basis for comparing their preferences with the eventual direction of the Convention. The Appendix (pp. 134-38 below) summarizes these votes by date. At the outset, then, we see Washington and Franklin opposed in practice if not in principle. We see still more: while Franklin was generally voting in the minority on this question within his delegation, Washington voted in the majority within his delegation. We also learn something about the probable voting coalitions, thanks to Madison’s care in detailing certain transactions within the Virginia delegation. In addition to the fact that Mason defended the money provision and, therefore, probably voted for it, we see on August 21 that Mason and Randolph voted together in favor of a provision desired by the defenders of slavery, and prevailed over Madison and Washington by attracting the swing vote of Blair. The fact of Blair’s swing is established in the votes of July 26 (executive clause) and September 12 (vote to weaken executive veto). On the money bill provision, accordingly, it is highly likely that Blair voted with Madison and Washington, while Mason and Randolph formed an opposing bloc, after June 13. For on June 13 (before it became a part of the compromise package) it must have been Madison and Washington who formed the minority. On other questions, of course, the delegations voted with actual or virtual unanimity. Thus, these votes, too, may be attributed to Washington and Franklin. A negative instance of this arose on May 31, when Madison noted that Pennsylvania voted against bicameralism “probably from complaisance to Dr. Franklin.” We see immediately thereafter that Pennsylvania reverted to general, and even enthusiastic support of bicameralism (6/21). To imagine Franklin continuing to hold out in this case would suppose a degree of churlishness not admissible by what we know of his character. If we would, therefore, impute the votes of Washington and Franklin according to their delegations’ votes, making exceptions such as the foregoing by expressly accounting for differences in voting, the result should be a general portrait of their views and their potential influence in the Convention. Where their delegations diverge, so, too, would their views and the converse. For example, Virginia warmed slowly to James Wilson’s electoral college scheme, and we may imagine that Washington did too (6/2, 7/17, 7/19, 8/24, and 9/5). Or, again, to take James Madison’s proposals for a council of revision, we find Madison and Mason leading a consistent Virginia defense of the proposition. This creates a fair impression of unanimity in Virginia. Pennsylvania, on the other hand, consistently voted against it even as Wilson and Gouverneur Morris made speeches in support. Where did Franklin stand? He was not explicit, save in resisting an absolute veto for the executive and conceiving a council as preferable to that. But was not a suspensive veto still more preferable? For that is what he immediately supported as soon as the absolute veto was dead. Pennsylvania had eight delegates, and odds are good that Robert Morris stood with Gouverneur Morris and James Wilson. 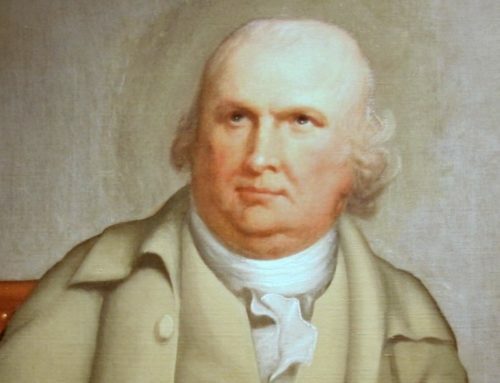 Additionally, Pennsylvania moved from being “no to “divided between June 6 (when Gouverneur Morris was absent) and July 21 (when he was present). His vote, then, may have been added to these others to produce a stand-off at four. Of the remaining delegates, Clymer, Fitzsimmons, Ingersoll, Mifflin, and Franklin, at least one – on any calculation favored the council of revision. On September 7 Franklin seconded a motion by George Mason, proposing the establishment of an executive council: This was not the same as a council of revision – with its implicit veto authority – but it did evoke from Franklin an argument remarkably similar to his argument against the absolute veto. It is therefore reasonable to conclude that Franklin, somewhat reluctantly, voted in favor of the council of revision from the start. If so, he voted with Washington and Virginia and against the majority of his Pennsylvania delegation. Of course, the electoral college eventually prevailed, while the council of revision and executive council never did. Do Washington and Franklin lead or follow their delegations in their migration toward each other? While Franklin apparently favored a plural executive (6/2 and6/4), the Convention settled on a single executive – Washington’s preference in his divided Virginia delegation. Franklin favored, but did not fight for, a unicameral legislature; Washington supported a bicameral legislature in his votes and opinions Franklin urged service without pay in the executive office and the senate; Washington advocated professional, compensated public service (though not for himself) Franklin and Washington both supported the separation of powers, and governmental powers to apply directly on citizens rather than on state governments. Franklin pushed the large state-small state compromise, whereby the House would originate money bills exclusively, while the Senate would be constituted on the basis of an equal vote per state. 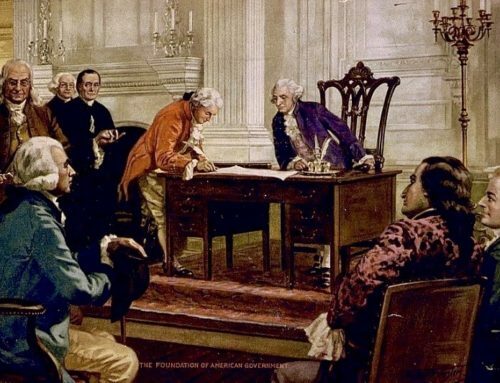 Washington agreed with other nationalists that this was no compromise at all, since the power to amend money bills in the Senate (which they insisted on) rendered it nugatory and since the nationalists were unpersuaded of its utility anyway. His decision finally to vote for it he regarded as a concession rather than a compromise. The nationalists settled for what they could get, affirming their principle of a national basis of representation and government (per capita voting in the Senate) even if not designing it with the preferred symmetry. In other words, to nationalists both sides of the compromise were objectionable. Hence, there was no compromise in fact; merely acceptance that they could not otherwise obtain agreement save by accepting these mechanisms. In surveying these differences and the relative influence of Washington and Franklin, it becomes clear at length that Washington’s position – including his concessions – operated far more powerfully as a necessary condition of agreement within the Convention than those of Franklin. A survey of Franklin’s speeches would convey as much. He prevailed, as on August 7, when he resisted inclinations to narrow the base of suffrage in the country: “It is of great consequence that we shld. not depress the virtue & public spirit of our common people.” Or, again, on August 10: “Doctr. Franklin expressed his dislike of everything that tended to debase the spirit of the common people.” Thus, as to the genius or spirit of the government, Franklin often expressed, though not alone, the position which in general prevailed. Whenever questions of structure and operations arose (the political science), however, with the single exception of the “Great Compromise,” Franklin generally lost. Accordingly, he frequently found himself switching to support of the contrary position. We may gain a clearer view of this process by focusing on the fourteen clearly identified votes (omitting the first vote of “complaisance”) in terms of where Franklin stood both within his own delegation and vis-a-vis Virginia. Such a review reveals that Franklin voted with the Pennsylvania majority seven of fourteen times. Whenever he voted against his delegation’s majority, he also voted against Virginia’s majority six out of seven times; whereas he voted against Virginia when voting with Pennsylvania only two out of seven limes. Conversely, he was with Virginia five out of seven times when he was also with Pennsylvania’s majority and was with Virginia when against Pennsylvania only one in seven times. Another way of stating this is that Virginia’s and Pennsylvania’s majorities diverged on only three of these votes. The result is that the political ground tone of the Convention seems to have been set by Virginia, and in Virginia largely by George Washington (his money bill switch was a catalyst). spite of the spirit of accomplishment which filled the air, however, the Convention remained a parliamentary body. Motions were still in order. Massachusetts’s Gorham rose to move an alteration in the formula for representation. He urged a reduction in the scale of representation, from 1: 40,000 to 1: 30,000. King of Massachusetts and Carroll of Maryland “seconded and supported” his idea, despite the fact that the Convention had reaffirmed the rule of 1: 40,000, on a motion of James Madison, more than a month before (8/8) and had undergone numerous discussions prior to that time. If anything was settled, this was it. Indeed, Madison’s motion had been that, considering the future growth of population, the rule of 1: 40,000 would produce too large a representation, and therefore the provision should read” not exceeding one for every 40,000.” The Convention at that time accepted it nem contradicente. When the President rose, for the purpose of putting the question, he said that although his situation had hitherto restrained him from offering his sentiments on questions depending in the House, and it might be thought, ought now to impose silence on him, yet he could not forbear expressing his wish that the alteration proposed might take place. It was much to be desired that the objections to the plan recommended might be made as few as possible-the smallness of the proportion of Representatives had been considered by many members of the Convention, an insufficient security for the rights & interests of the people. He acknowledged that it had always appeared to himself among the exceptionable parts of the plan; and late as the present moment was for admitting amendments, he thought this of so much consequence that it would give much satisfaction to see it adopted. Following this appeal no voice of opposition was raised and the measure passed unanimously. Washington thereby set his seal on the genius of the regime as he had theretofore silently worked to assure that an adequate structure, capable of governing, would be erected. In this display we behold an instance of Washington’s influence within the Convention. The question it raises, however, is whether this instance were not rather emblematic of the kind of influence he exercised throughout. He said that it would give him “satisfaction” to see the change adopted. His appeal was almost aesthetic; it was a matter of taste. Could it have been that Washington was such a soul as could impart direction merely by making his disposition known? This last question not only prepares the way for future researchers to discover how Washington (and perhaps Franklin) could have been symbols in the Convention; it also gives place for a concluding assessment of the relative influence of Washington and Franklin within the Convention. For one item to be considered in that assessment is surely the question of what they contributed in the aftermath of the Convention to realize the purposes they had pursued within the Convention. In the case of Washington the question is complicated. He addressed the Congress and the nation in the form of the letter of transmittal wherewith the Constitution was forwarded to the Confederation Congress. That letter, however, was drafted not by Washington but the Convention’s Committee of Style. We shall ignore it, therefore, in seeking Washington’s own view. Unlike a great number of the nationalists, however, Washington did not undertake a general campaign of public declamation and publication on behalf of the Constitution-at least not directly. True to his past experience, his private expressions of opinion did have the facility of finding their way into the press.” Washington’s opinions, even rumors of them, were too good copy to be passed over even at his desire.” Nevertheless, he held to his resolve not to appear as a partisan in the interesting subject.” He wished, rather, that the Constitution “might stand or fall according to its merits or demerits.” Much of what he thought of the Convention’s accomplishment he revealed in letters to friends, particularly distant friends such as Catherine Macaulay-Graham and Lafayette. To Lafayette, for example, he could boast that the Constitution is provided with more checks and barriers against the introduction of tyranny, and those of a nature less liable to be surmounted, than any government hitherto instituted among mortals hath possessed.” We seek, however, a more programmatic expression of Washington’ s views, especially one that might take the form of a public deed. Unfortunately, the prime candidate for this office is lost to us in the main. I refer to the “Discarded Inaugural Address.” “Too long and too radical, Washington’s first draft of his first inaugural address was never delivered. Its pages scattered by a thoughtless scholar, it is here partially recreated.” Those words introduced the most extensive collection of the fragments of the “discarded inaugural” heretofore published. The “thoughtless scholar” to whom Stein referred was Jared Sparks, the nineteenth-century compiler of Washington’s papers. Sparks took the judgment of James Madison, that the address would be an embarrassment to Washington, not only as a reason not to include it among his published works, but also to scissor it into samples of Washington’s autograph for his numerous friends and acquaintances around the country. Long presumed to be the work of David Humphreys, in spite of existing in Washington’s own handwriting, this work has been largely ignored. Even the casual reader of Washington’s papers, however, will find the echoes of its ideas throughout Washington’s correspondence reaching back as far as six years. We can only speculate about the meaning of Washington having apparently written to Madison that this was Humphrey’s work, but we cannot rule out the possibility that he did so from a desire to encourage the most candid response from Madison. It is clear from the fragments we do have that if we had the whole of the “discarded inaugural,” it would rank alongside and perhaps above Washington’s 1783 “Circular Address” as a comprehensive statement of his political understanding. Standing even in its defective form, it is a manifest contribution to our understanding how far Washington’s understanding as opposed to his image informed the founding of the United States. One example would be his assertion in the document that “I presume now to assert that better may not still be devised.” This is clearly Washington’s retrospective judgment on the work of the Convention, many of whose members he had warned beforehand to aim, not for the most that is acceptable, but for the best possible. Although the agency I had in forming this system, and the high opinion I entertained of my Colleagues for their ability and integrity may have tended to warp my judgment in its favour; yet I will not pretend to say that it appears absolutely perfect to me, or that there may not be many faults which have escaped my discernment. I will only say, that, during and since the session of the Convention, I have attentively heard and read every oral and printed information on both sides of the question that could be procured. This long and laborious investigation, in which I endeavoured as far as the frailty of nature would permit to act with candour has resulted in a fixed belief that this Constitution, is really in its formation a government of the people; that is to say, a government in which all power is derived from, and at stated periods reverts to them – and that, in its operation, it is purely a government of Laws made and executed by the fair substitutes of the people alone. Besides the fact that this disclaimer is a practically verbatim quotation of Washington’s letter to Hamilton on the high merit of The Federalist, it is important to note the emphasis both on his agency in forming the system and his continued effort to assure himself as to its nature. The address rehearsed all of the structural components of the Constitution from the perspective both of their republican safety and efficiency. He judged its superiority to most constitutions which have existed in the world” on three grounds: first, it has adequate powers to perform the task of governing; secondly, it has no greater power than is requisite to accomplish the” safety and happiness of the governed”; and, third, (as he said to Lafayette) never before has any government so efficaciously guarded itself against degeneration into oppression. Washington continued to place the Constitution in the context of the Revolution, to show it as an accomplishment of the Revolution rather than of a latter-day departure. I rejoice in a belief that intellectual light will spring up in the dark corners of the earth; that freedom of enquiry will produce liberality of conduct; that mankind will reverse the absurd position that the many were, made for the few; and that they will not continue slaves in one part of the globe, when they can become freemen in another. Washington, accordingly, regarded the work of the Convention as enabling the pursuit of a political course which should vindicate the claims of self-government understood as the capacity of man to guide himself by the light of moral claims. The affirmation hinged on the twofold condition of accomplishing such a political structure as would preserve to individuals the opportunity to pursue that course at the same time as men in general proved capable of doing so. They would qualify for self-government in the sense of free institutions in proportion as they qualified for self-government in the sense of that capacity of soul to govern themselves by the light of reason. Insofar as Washington’s efforts within the Convention were directed toward that end, our assessment of his influence must be governed by the need to discern that principle at work. We have already suggested the basis for such a judgment. It bears repeating, however, that Washington’s final contribution to the Convention testifies as well as anything may that he, at least, judged at the end that he had accomplished his goal. The time to make a bow to democracy was precisely at that moment when judgment held that democracy had been safely hedged in with appropriate checks and guides. This was surely Washington’s way of joining in Franklin’s recognition of the sun painted at the back of the president’s chair as a rising, not a setting sun. Franklin did not bring profound talent for devising institutions of government to this exacting task. He brought what was most needed in the aftermath of revolution where the premium had been on ringing words, reckless courage, and persistence in principle: the wisdom of experience, the good sense of a sage, and an unfailing instinct for proposing the next short step men might take in agreement, or at least in agreement to disagree. Certainly Franklin’s midwifery in the ” Great Compromise” might confirm an important part of this appraisal. Then, too, the fact that Franklin in 1787 was already well advanced in years – twenty years the senior of the next oldest delegate – and yet kept to the grueling pace (five hours every day from the start), provides evidence that “persistence in principle” yet had place to operate. Still, however, Franklin had a contribution of great significance to make. Just as Washington’s countrymen had greeted the Convention with the reprinting of his 1783 “Circular Address,” they celebrated its close with the widespread reprinting of Franklin’s famous closing speech. Thus, Franklin’s contribution in the aftermath of the Convention has the special value of also having been an essential contribution within the Convention. Because the final speech had been devised by Gouverneur Morris, questions may arise as to how far it can be attributed to Franklin’s virtues. Nevertheless, I shall make the case that there we can find the definitive gloss on Franklin’s influence and contribution. It should be remembered, too, that works like Franklin’s speech had a far greater effect in the actual climate of the time than works such as The Federalist, so greatly celebrated today. The problem at hand at the Close of the Convention lay in the fact that not all the states were represented, and of those that were, not all the delegates approved the Constitution. Nevertheless, the supporters of the Constitution wished much to go to the country with a show of unanimity. Franklin’s speech contained the vehicle which was designed to muster at least a show of unanimity, namely, a signing by individuals, with testimony to the unanimity of the states (obscuring the minority representation in states such as Virginia and treating New York as not represented in spite of Hamilton’s presence). Well before Franklin reached the point of that motion in his speech, he had much to say about the work of the Convention, and that is what appealed to his countrymen in the aftermath. Franklin opened the speech with the “confession” that several parts of the Constitution did not meet his approval. But, said he, “I am not sure I shall never approve them.” The posture of openness christened his recommendation of the Constitution. Nor was it mere affectation. That openness was not mere skepticism; it was occasioned by a lively sense of the country’s urgencies. The country needed a general government and, like Pope, he was not certain but that any government, well administered, might “be a blessing to the people.” His counsel therefore inculcated faith in the virtues of George Washing-‘ ton, whom he had nominated for the presidency of the Convention and whom he anticipated, like everyone else, to be charged with the superintending duty under the new government. I consent, Sir, to this Constitution because I expect no better, and because I am not sure, that it is not the best. The opinions I have had of its errors, I sacrifice to the public good. Franklin made a concession, then, a concession to the public good. His concession at the end of the Convention mirrors Washington’s concessions in the course of the Convention; it was perhaps prepared by them. Franklin understood the importance of conciliating public opinion. He thought, however, that to entertain them with good opinion might contribute as much to doing so as to enlighten them. Accordingly, he was willing to pledge to keep his reservations about the Constitution “within these walls,” and to speak of the “wisdom and integrity” of the nation’s governors out of doors. Franklin appreciated the value of worthy symbols as much as he did the necessity to prepare the public mind for innovations. Perhaps a fair part of preparing the public mind for innovations, in his view, consisted in producing for it worthy symbols. From this angle, however, we have regard only to the fact that Franklin spoke within the Convention. We have noted, though, that his speech was widely printed in the country, more extensively than The Federalist. Franklin did not so much keep his secret as reveal that those to whom he had made the pledge were worth keeping secrets for. He brought Americans into the secret, thereby enlisting them in the project of giving General Washington’s dream a chance. So, too, did he conduct himself within the Convention. We may conclude, therefore, that he had a more than symbolic influence. For all his tentative ideas, he held fast to the notion of building faith in the novel idea of self-government on an imperial scale. Reprinted with the gracious permission of The Political Science Reviewer (Volume 17, Number 1, Fall, 1987). The Documentary History of the Ratification of the Constitution, John P. Kaminski and Gaspare J. Saladino, eds. (Madison : State Historical Society of Wisconsin, 1981), vol. XIII,” Commentaries on the Constitution: Public and Private,” vol. I, 80. The Essential Antifederalist, W.B. Allen and Gordon Lloyd, eds. (Lanham, Md. : University Press of America, 1985), 95. Henry Knox to George Washington, quoted in “Washington and the Constitution,” David M. Matteson, #7 in Honor to George Washington, ed. by Albert Bushnell Hart for the George Washington Bicentennial Commission, Washington, D.C., 1931, 13. Benjamin Franklin, The Autobiography of Benjamin Franklin (New York: Collier Macmillan Publishers, 1962), 79. Benjamin Franklin, “Consolation for America, or remarks on her real situation, interests, and policy,” The American Museum, January 1787, 1. This was the initial issue of the Museum. Benjamin Rush,” An Address to the People of the United States,” The American Museum, January, 1787, 9. Compare the argument in The Federalist, number sixty three. The federalists mounted a sustained campaign to convey the idea of the “alienation” of the people’s authority. I have described this in an essay, “Federal Representation: The Design of the Thirty-Fifth Federalist Paper,” Publius, vol. 6, no. 3, 1976. Op. cit., Kaminski and Saladino, 60-62. See Douglass Southall Freeman, George Washington: A Biography (New York: Scribners, 1948-57), vols. V & VI. Also, see N. K. Risjord, Chesapeake Politics (New York: Columbia University Press, 1978), chaps. 3-8, especially pages 84-85. Compare, John Marshall, The Life of George Washington (Philadelphia: James Crissy, 1838 [2d. edition]), chs. III & IV. To David Humphreys, July 25, 1785. General Orders, July 4, 1775, from Cambridge. To the Inhabitants of Canada . To General Thomas Gage, August 20, 1775. To John Bannister, April 21, 1778, Valley Forge. General Orders, March 1,1778, Valley Forge. To John Augustine Washington, May 31, 1776. To Robert Morris, June 3, 1783. ” The Farewell Address,” paragraphs 7-10. To James Madison, March 31, 1787. To Bushrod Washington, September 30, 1786. Inaugural Speech, April 30, 1789:” When I was first honored with a call into the service of my country, then on the eve of an arduous struggle for its liberties, the light in which I contemplated my duty, required that I should renounce every pecuniary compensation. From this resolution I have in no instance departed. And being still under the impressions which produced it, I must decline, as inapplicable to myself, any share in the personal emoluments which may be indispensably included in a permanent provision for the Executive Department; and must accordingly pray, that the pecuniary estimates for the station in which I am placed, may, during my continuance in it, be limited to such actual expenditures as the public good may be thought to require.” The Congress, upon consideration, disagreed with the President and ordered a regular salary for him. The votes of 6/4 (2) on the absolute veto and the suspensive veto; 6/12 on the substitution of” fixed” for “liberal” in a compensation clause; 6/26 on senate compensation; 7/2 on his motion on composition of senate; 7/6 on money bills; 7/16 on the ” Great Compromise;” 7/18 on the inclusion of” increase” in the limitation on judicial salaries; 7/20 on impeaching the executive; 8/8 on a motion to strike the money bill provision; 8/13 on money bills; 9/7on the executive council; 9/8 on money bill; and 9/ 17 on Washington’ s representation position. Op. cit., David Matteson, 21. To Lafayette, February 7, 1788. Nathaniel Stein,” Washington’s Discarded Inaugural,” Manuscripts, vol. x, no. 2, Spring, 1958. He did keep one secret: The motion which set up the device for creating an image of unanimity was varied in publication, altered so to read, “make manifest our unanimity,” without hinting at the distinction between states represented and not represented. Along with that, the passage in the speech in which he candidly referred to our real or apparent unanimity” was elided from the original Boston Gazette printing. * The votes recorded in this table are taken entirely from James Madison’s notes, as reproduced in The Records of the Federal Convention of 1787, ed. Max Farrand (New Haven: Yale Univ. Press, 1966), vols. I and II. Dr. William B. Allen is Veritas Fund and Miller Senior Fellow at the Matthew J. Ryan Center of Villanova University. Additionally, he serves as Associate Pastor of First Baptist Church in Havre de Grace (MD) and is Dean Emeritus, and Emeritus Professor of Political Science, of the James Madison College of Michigan State University. He is author of George Washington: America's First Progressive and Rethinking Uncle Tom: The Political Thought of Harriet Beecher Stowe. Dr. Allen is the editor of George Washington: A Collection and Works of Fisher Ames: In Two Volumes.